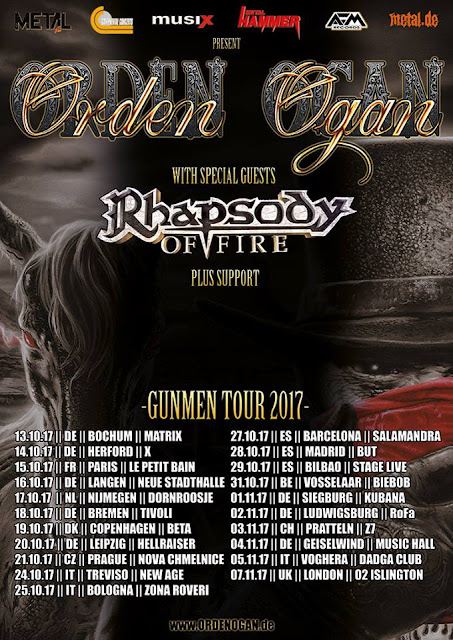 ORDEN OGAN announce ‘Gunmen’ Tour with Special Guests Rhapsody Of Fire! 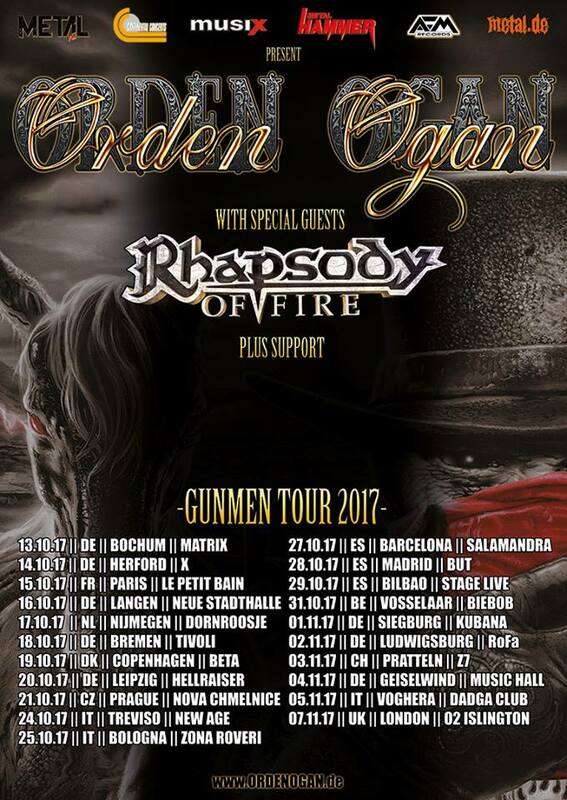 The German melodic power metal institution ORDEN OGAN will embark on their next headlining European tour this October and November. With them on the road: their new studio record ‘Gunmen’ and the special guests RHAPSODY OF FIRE. They will play the sole UK show of the tour at the O2 Islington on 7th November. ORDEN OGAN, Germany’s premier power metallers, have exceeded themselves with their new (5th) studio album, titled ‘Gunmen’, out July 7th. Undoubtedly, the band has delivered their heaviest but at the same time also most melodic piece of work. With their latest studio album “Ravenhead” (2015), ORDEN OGAN toured Europe supporting HammerFall and later Powerwolf, before running their first own European headlining tour in March 2016. “Ravenhead” became a chart success in several European countries, with #16 in the German album chart marking their all-time best result. Now “Gunmen” continues the band’s track record, combining classic Teutonic metal with a modern production on international top level. All this results in 10 metal hymns for eternity! On October 13th, the band’s next headlining tour will kick off – and it’s about to become one of the year’s best melodic metal tours for sure. Italian symphonic power metal masters RHAPSODY OF FIRE will be ORDEN OGAN’s special guests this time and another high-class supporting act will be announced soon as well. RHAPSODY OF FIRE have just released their new album ‘Legendary Years’ that features re-recordings of old classics and was mixed and mastered by ORDEN OGAN singer/producer Seeb. On this tour they will present new singer Giacomo Voli and the new drummer Manuel Lotter (ex-Emil Bulls). The ‘Gunmen’ album consists of 10 songs, including a guest appearance by former Leaves’ Eyes/Theatre Of Tragedy vocalist Liv Kristine on the track ‘Come With Me To The Other Side’. ‘Gunmen’ was once again produced by the band’s guitarist/vocalist Seeb Levermann, who just recently has also completed mix & mastering of the upcoming Rhapsody Of Fire release ‘Legendary Years’. MUTATION Unleashes New Music Video "Hate"